A casino on a steam punk style, 1930s airship is the unusual backstory to Cazino Zeppelin. Powered by Yggdrasil Gaming and beautifully designed as always, it’s a 5 reel, 20 payline video slot that is optimised for desktop, tablet and mobile devices. Goodies on offer in this casino in the air include sticky wilds, wild transfers and a free spins feature. Take to the skies from between 20p and £10 per spin. 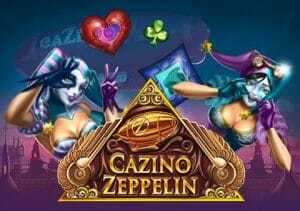 Yggdrasil Gaming powered games are usually very easy on the eye and ear and that’s certainly true of Cazino Zeppelin – the images have a glossy, HD sheen with the action playing out to a lush, orchestral backing track. Symbols on show include playing card suit symbols as well as a quartet of gamblers. The most lucrative of these is the dapper, pipe smoker who awards 40, 300 or 2,000 coins if you land 3, 4 or 5 on 1 of the game’s 20 paylines. There’s also a standard wild that replaces all other symbols apart from the scatter. The casino chip is that scatter – land 3, 4 or 5 of these anywhere on the reels and you’ll receive a 40 coin payout as well as the Free Spins feature. You will receive 10, 15 or 20 free spins. If there are any wilds on the reels on the triggering spin, they will be held for the feature. Any subsequent wilds that land during the feature will also be held in place for the remainder of your free spins. If you manage to get wilds on all 5 reels during the feature, an extra tally of 5 free spins will be added to your total. Airships in the 1930s weren’t the safest means of transportation and the same could be said of your bankroll playing Cazino Zeppelin – the variance here is in the medium high range so expect spells where your money can float away into the ether. Big wins can appear seemingly from nowhere though. Featuring fantastic design and a super smooth game engine, Cazino Zeppelin is a joy to play. It’s not just a thing of beauty though as there’s some power hidden underneath the sleek sound and visuals. Riding the Zeppelin can be a risky affair but with potential prizes of some 2,000 times your stake per spin on offer this casino in the sky can be a tempting proposition if the luck is with you. I highly recommend you play Yggdrasil Gaming titles with Vikings Go Wild and Super Heroes my favourites.